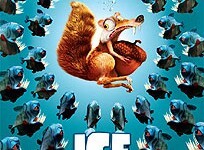 In "Ice Age: The Meltdown," our sub-zero heroes from the worldwide blockbuster CGI film "Ice Age" are back – Manny the woolly mammoth, Sid the sloth, Diego the saber-toothed tiger and the hapless saber-toothed squirrel known as Scrat. In the new film, from the Academy Award®- winning creators of "Ice Age" and "Robots," the Ice Age is coming to an end, and the animals are delighting in the melting paradise that is their new world. Manny, Sid, and Diego quickly learn that the warming climate has one major drawback: a huge glacial dam is about to break, threatening the entire valley. The only chance of survival lies at the other end of the valley. So our three heroes, along with a mammoth named Ellie (Queen Latifah) and her two "brothers" – possums Crash and Eddie – embark on a mission across an increasingly dangerous landscape towards their salvation.